read by means of Wireless M-Bus, which is built into the meter. MULTICALR 21/flowIQR 2101 has built-in sensitive leak monitoring, as low as 0.1 % of Q3, which means that even the smallest water losses are detected very quickly. The unique combination of pinpoint measuring accuracy, longevity and built-in radio communication reduces the operating costs for the water company continuously and contingencies, caused by any leakage, are minimized, as waste of water is discovered immediately. MULTICALR 21/flowIQR 2101 is equipped with a long range antenna that transmits strong radio signals with intelligent coding to the network. The meter can also be read from a long distance with ’Drive-by’. 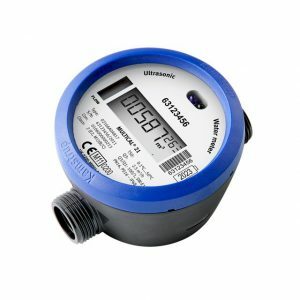 The water meter is easy to install in all operating environments, horizontally as well as vertically, independent of piping and installation conditions. 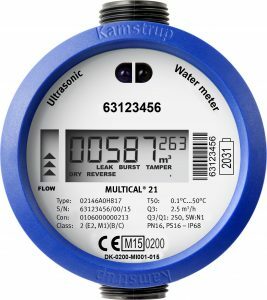 The meter comes with a large and easy to read display and the meter is constructed as a hermetically vacuum sealed unit, which prevents humidity from reaching the electronics. Therefore condensation water between the glass and the large display is avoided. The meter is also available in a version with Wired M-Bus, providing a comprehensive datagram acc. to EN 13757:2013 – used in applications using M-Bus protocol. MULTICALR 21 with Wired M-Bus is ordered under the name flowIQR 2101.